A factory Ruger No. 1 chambered for the 300 H&H cartridge was the raw material provided to Gary Goudy. He fitted the Kepplinger trigger to the rifle and did all the metal polishing. Goudy then crafted the stock from a superb stick of English walnut, finished off by one of his trademark exquisite checkering jobs. The pattern he used is reminiscent of patterns used on high-grade Winchester guns in the past. Herman Waldron started with a small ring VZ-33 Mauser action for this rifle. He did all the metalsmithing chores necessary to convert the military action to a wonderful sporting rifle, including stippling the bolt knob. He fitted the barrel and chambered it for the 25-06 cartridge. Fisher/Blackburn rounded bottom metal was used for the rifle as well. Gary Goudy fashioned the lovely custom stock from a nice stick of California English walnut, and executed one of his renowned checkering patterns on it. This rifle is ready for the field. This Remington Model 700 Left Hand rifle came from the shop of the Williams Gun Sight Company. The detail photos show various examples of the work. The factory action was “blueprinted” and the barrel-mounted recoil lug removed. A new recoil lug was pinned and soldered in place. New England Custom Gun sights and EAW scope mounts were installed. The custom Bastogne walnut stock features a Dakota skeleton grip cap and buttplate, and is extensively checkered with a 26 panel pattern with fine ribbons throughout. All metalwork was accomplished by Williams metalsmith Rob Canze, and the stock and checkering executed by Williams stockmaker Kevin Wigton. Gunmaker Hughes was looking for a suitable sidelock barreled action around which to craft a superb duck gun for one of his clients. He found what he was looking for when a Belgian exhibitor at the SCI Convention displayed an in-the-white barreled action. It had been made in Belgium by Britte Armes En Blanc, which ceased making sporting gun parts in 1936. That barreled action had been sitting in the basement of the former company for nearly seventy years! Hughes did much of the metalwork, rust-bluing the gun, and nitre-bluing the screws and small parts. E.L. “Larry” Peters executed the wonderful layout and engraving, Doug Turnbull Restorations did the color case-hardening, and J. Peter “Pete” Mazur charcoal-blacked the furniture and gold-plated the lock parts. A lightweight 270 Improved from the shop of Lee Helgeland, weighing in at six pounds, twelve ounces, with scope and mounts. It features a G3?0 Mauser action and a 26-inch Krieger barrel. The stock was crafted from a stick of tiger-tail California English walnut. Jerome Glimm did the screw head engraving, George Komadina did the rust blue, and Larry Baer did the color case on the trigger guard, rings and bases. Lee did everything else, in-house. Close-up view of an absolutely magnificent Winchester 73 that Bob Swartley engraved “after the art of Albert Bierstadt.” Swartley’s scrollwork is so distinctive that it can be recognized from a distance by anyone even slightly knowledgeable of his work. His bulino work is delicate and utterly exquisite. Jim Blair is another relatively young engraver whose work is so good it is mind-boggling. His work on this 22 is superlative. I can’t imagine a more attractive job than this example of his artistry. A right side and left-side view of a lovely rifle which exhibits a little of the California influence on maker Ray Riganian. The diamond-shaped ivory inlays are somewhat reminiscent of the Roy Weatherby rifle. Ray started with a Winchester Model 70 Classic action, and he applied all the bells and whistles to it. Surface grinding, truing all surfaces concentric with the bore, fitting Blackburn bottom metal, making custom bases for modified Talley rings, building up and checkering the bolt release, and thinning the trigger to a shotgun-type trigger, are just some of the refinements to the action. He fitted a Krieger barrel and chambered it for the 7mm Weatherby Magnum cartridge. He then crafted the stock from a very nice stick of California English walnut, and pillar-bedded the barreled action into the wood. This rifle is a tack-driver, according to Riganian. The Springfield action 400 Whelen rifle from the shop of N.L. Heineke is shown here without the case and accessories. Styled after the pre-war Griffin & Howe sporters so favored by Col. Whelen, it is a superb rifle. The rifle is chambered for the 400 Whelen cartridge, and is fitted with two scopes, a Burris 4? scope and a Lyman Alaskan 2.5? scope, but mounted in G&H side mounts. A magnificent Terry Tussey custom 45 auto fabricated from a Caspian Arms frame and slide. When finished, master engraver Eric Gold, who also carved the superb ivory grips, marvelously engraved the gun. 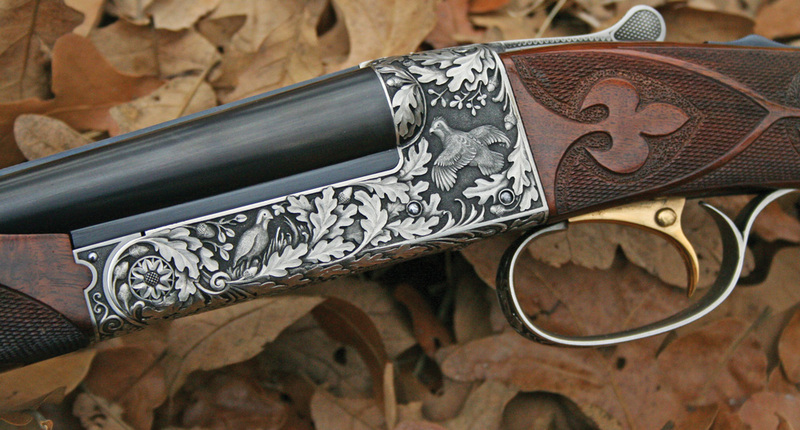 This gun is a superb?example of the engraver’s art. This cased flintlock pistol is the work of Jerry Huddleston. Jerry made every item and every piece in this set, including the case, with the exception of the commercially acquired lock. Even there, he completely redid the lock to meet his requirements. He even cast all the silver accoutrements, and made the barrel. He also did all the engraving and inlay work. A nice side view of a lovely Colt Single Action Army revolver. The revolver is a 5 ?-inch barrel 357 Magnum 3rd Generation Colt. Ron engraved the gun in what Colt calls tight American scroll, ? coverage or “C” coverage. The gold inlay work is in the fashion of Leonard Francolini. Dan Chesnak did the ivory grips, and the case colors and bluing are by Dewey Vicknair. Two images of a glorious rifle put together by a team of superb craftsmen. The action is a “baby” Farquharson that was made by Clayton Nelson, probably twenty or so years ago. Fine rifle connoisseur Jack Lilliendahl somehow ended up with the action and another superb project was begun. Steve Heilmann did the metalwork on the rifle, and barreled and chambered it for the 17 HMR cartridge. Stockmaker James Tucker crafted the extraordinary stock from an exceptional stick of walnut. Sam Welch executed the engraving in a theme suitable to the caliber of the rifle, and dubbed the rifle the “Rabbit rifle,” or sometimes “Thumper.” The finishing chores were turned over to Pete Mazur, a master of the alchemy of metal finishing.